Raaga.com: Hema Malani soon to become Grandmother! Hema Malani soon to become Grandmother! Famous Bollywood actress Hema Malani and superstar Dharmendra recently celebrated their 37 wedding anniversary and now the happy couple are being blessed by a grandchild. While Dharmendra has tasted the pleasure of being a grandfather with his son Sunny Deol’s children, this is the first time when Dream Girl aka Hema Malini will experience the bliss of being a grandmother in real life. Hence she is eagerly waiting to become a grandmother! 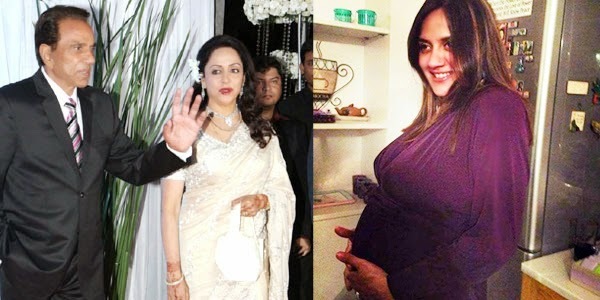 Readers may know that Hema Malini and Dharmendra's youngest daughter Ahana, who got married to a Delhi-based businessman Vaibhav Vohra last year, is her final stages of pregnancy. “It’s a promotion from mother to grandmother, and it's a beautiful experience that my daughter is giving me. That's the procedure of life and I'm enjoying this whole process," Hema added. She informed that the baby will be delivered in Mumbai and she would be around Ahana playing a perfect Nani’s role. On being quizzed she doesn’t look like a grandmother an peeved Hema Malani retorted, “What do you mean by saying I don't look like a granny? I will feel like one when I hold Ahana's baby in my hands!"